Last Saturday, I ventured out in the bitter cold to check out a new pop-up market nearby. Lucky Star Market was held at Prairie Moon Winery in Ames, IA for the first time on December 7. I knew it would be a great place to get Christmas presents, and I was not disappointed. I would love to share ALL of the amazing vendors, but a girl’s gotta stop somewhere! So today, I’m going to highlight my 5 favorite vendors, and I encourage you to check them out for holiday (or anyday) shopping. I didn’t purchase anything from this vendor, but his stuff was REALLY cool and UNIQUE! He had wooden laptop and ipad sleeves, as well as these amazing wood grain prints. I bought a Christmas gift for my brother from this vendor. 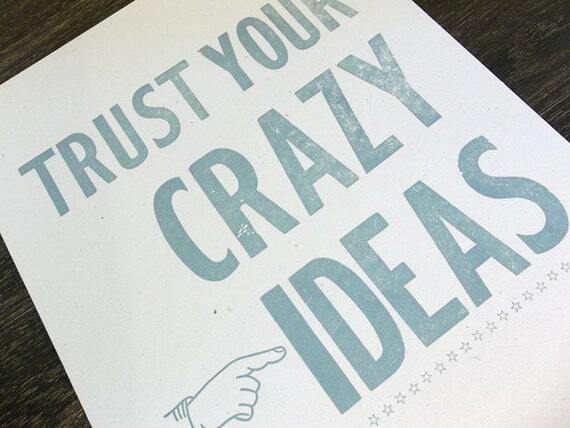 I almost got him this “Trust Your Crazy Ideas” print, but decided his ideas were just a little TOO crazy for that. I practically begged this sign painter to set up a booth at our spring HomeShed sale. Wouldn’t that be amazing? She paints all her signs by hand – no stencil or predesigning. I’m pretty much in awe. Another printing press, but I loved their designs so much! I bought two prints for the boys’ playroom and can’t wait to get them hung. JB Knacker is the original central Iowa “junk” shop. Brenda never disappoints. Order online? Sadly, no. But you MUST visit if you are ever in the area! I really wanted to go to this! Looks like some amazing stuff. Ingrained Sleeve is my fav! I love those tree trunk prints. I really want to visit Ames. We haven't gotten there quite yet. I got excited, too, when I found out there's a Korean restaurant. I haven't been to the Korean restaurant. We should go together! My Mom was telling me about this. I'm not sure if she went or not but she knew some past students (ISU graphic design) that were exhibiting there. I'll have to check some of these places out! And Jeni - yes, I think you would enjoy Ames! Hi...FYI, we are having a Spring Lucky Star Market on Saturday, Aril 26th @ Prairie Moon...65 vendors...so excited...come and see us again! !